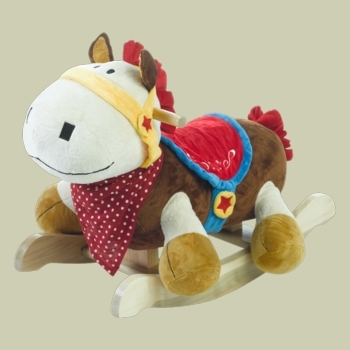 Debonair Pete is a modern classic rocking horse for little cowboys and cowgirls. He�s a good dresser and very fun, and he�s educational, too. Here�s how: Pete comes with buttons on the back of his head which activate delightful songs that teach ABCs, numbers 1-10, shapes, colors and more. It�s one toy that is both parent and li�l rider approved! Have your rocker personalized and create a cherished gift. When you select personalization (11 character limit), a wood rail will be engraved then painted for a stand out look. Click on More Images above to view name color choices and more rocker photos. Made with pride in the USA, including hardwood, stuffing, production, assembly, and packaging.Fabric skins and music boxes are from overseas.